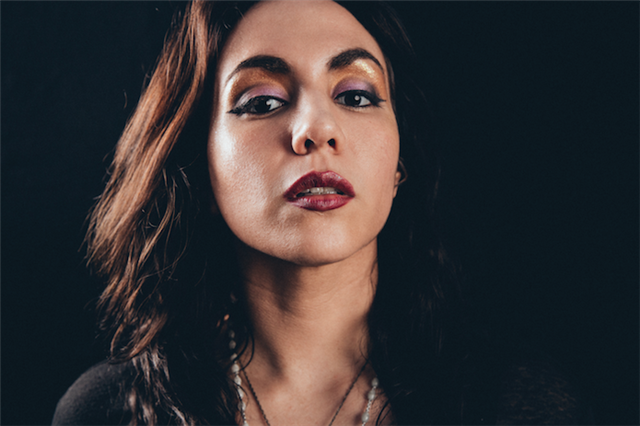 Latinx rising star Nina Diaz was discovered by rock’n’roll icon Joan Jett who signed her band out of San Antonio, Texas called Girl In A Coma. Diaz has been championed by NPR and the Tiny Desk Concert she performed has certainly (rightfully!) gotten her a lot of attention. See it HERE. Diaz recently re-located to Los Angeles and has been embedding herself in the community here by taking on the role of the Greek chorus* for the play with music called Evangeline, The Queen of Make-Believe. In this encore performance Nina Diaz picks up where Latin Grammy award winner Gaby Moreno left off last year. See the Los Angeles Times story on that HERE. The songs Nina is performing were written by multi-Grammy winners and Los Lobos' founders Louie Pérez and David Hidalgo (Louie Pérez also co-wrote the play). Nina is available to speak about EVANGELINE. Full details in the announcement below. Publicity photos in high resolution are available in the online press kit. Click on the URL below and enter the password to access. Nina Diaz (Girl in a Coma) is the featured lead singer in the 2019 remount of Evangeline, the Queen of Make-Believe at Plaza de la Raza. featuring the songbook of Los Lobos’ David Hidalgo and Louie Pérez." Evangeline, co-created by Louie Pérez (Los Lobos), Theresa Chavez (who also directs), and Rose Portillo (Zoot Suit) is set in 1968. As East Los Angeles explodes in its own civil rights movement, the Sunset Strip’s music captivates a recent high school graduate named Evangeline. She struggles with her identity as a devoted daughter by day and a West Hollywood go-go dancer by night. Exploring what lies across the L.A. River, Evangeline spreads her wings and lands in the enticing world of the burgeoning Hollywood art and music scene. As part of her personal journey, she must reconcile her need to hold on to familial bonds and her relationship to the changing neighborhood of her childhood. Nina Diaz elaborates "the Evangeline story not only focuses attention on the Latino community but embraces, with grace, the struggles Latinas face as we start to find our own independence from our family -- showing respect to our roots, yet striving for growth and finding our voices. It’s an honor to interpret the music of David Hidalgo and Louie Pérez of Los Lobos. Coming from rock 'n' roll roots, I’m excited to embrace the garage rock sound of The Neighborhood band.“ Diaz's own career has been nurtured by rock'n'roll icon Joan Jett, who signed Girl In A Coma to her label, Blackheart Records, and paved the way for the band to open for Morrissey, Tegan and Sara, and to earn multiple Independent Music Awards. The Evangeline remount is part of a two-year Evangeline Initiative which also expands opportunities for highest-risk and educationally disadvantaged youth by allowing them to experience the power of the 1968 era depicted in this play by offering admission to morning matinees and specialized workshops. The cast includes Sarah Cortez performing the lead role of Evangeline. She will be joined by Elizabeth Alvarez, Adrian Brizuela, Moises Castro, Lennon Hobson, and Keyla Monterroso Mejia. - Workshops at five East L.A. and Pasadena high schools for highest-risk and educationally disadvantaged youth, exploring Evangeline themes, and historic period. - Evangeline Discovery Guide - explores 1960s cultural & political history; distribution to Residency and Workshop students. Celebrating its 30th year About…Productions creates original interdisciplinary theaterworks and educational programs that provoke new perspectives on history, humanity, and culture. The company is dedicated to generating new work through collaboration to create artistic and community dialogue. We believe in the power of theater to enlighten audiences, transform youth, and celebrate the lives of seniors. The Evangeline Initiative is generously supported in part by the National Endowment for the Arts, California Arts Council, Los Angeles County Arts Commission, the City of Los Angeles Department of Cultural Affairs, City of Pasadena Cultural Affairs Division, Lincoln Heights Neighborhood Council, and The Puffin Foundation. The UCLA Chicano Studies Research Center is a co-sponsor. For press materials or additional information on Evangeline, the Queen of Make-Believe please contact Fly PR: T. (323) 667-1344 or info@flypr.net.